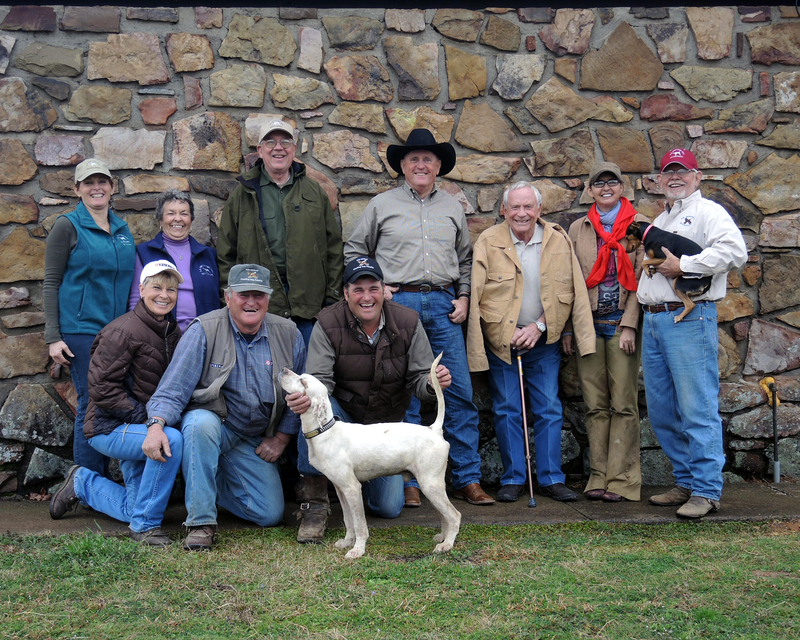 The 2013 US Shooting Dog Invitational Championship was held February 16 – 18, 2013. Winning the Championship was Great River Ice, handled by Mike Tracy and owned by Jack, Audrey & Brian Sanchez. CH – US SD Invitational OSD CH 12 x 10 = 120 + 400 bz = 520 1,960 pts. ….and the winner of the United States Shooting Dog Invitational Championship is Great River Ice!………… again. 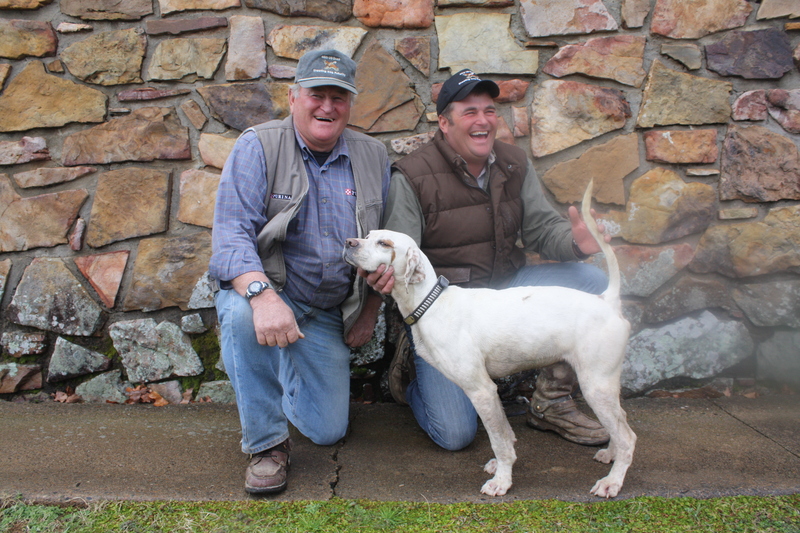 The handsome white pointer laid claim to this title two years ago and returned to repeat in ‘13. Owned by Great River Kennels, a.k.a. Audrey, Jack and Brian Sanchez of Central Islip, New York and handled by Mike Tracy of Glenville, Pennsylvania, Dan had strong, consistent performances on three consecutive days which is exactly what is desired. In his first appearance, he had two finds and on the second day, he had one, both days handling well and running an attractive, smooth race. In the 90-minute callback, he scored twice on game and still had energy left at the end of time. Camp Robinson WMA, located near Conway, Arkansas was the venue of the Invitational championship. Roger Martin is manager of the area and along with his assistants, Josh Fortner and brother, Larry Martin, they keep the area in tip-top shape. Apologies were extended about some factors but they were beyond their control anyway. Mother Nature bestowed another summer of drought which left the cover short-to-none. Then she returned on Christmas Day and covered the area with a thick layer of snow and ice. These elements flattened the thriving food plots of Egyptian wheat and brown top milo. Still, there was plenty game around for any competition. Martin and Fortner are always extremely accommodating to each and everyone. The writer heard remarks from several visitors from other states who were amazed at the facilities at Camp and the genuine hospitality with which they were received. Martin and Fortner together have a combined 32 years of service on these grounds. They know them like the back of their hands and can get the dog wagon to you at almost any spot in a timely fashion. The Invitational began as a classic back in 1978 under the leadership of John Seawright, I believe. In the late 80s, Robbie Robinson took over the reins and in 1990 it was accorded championship status. John “Buzz” and Liz Daugherty were in charge of the trial in 1996 and then handed it over to Johnny and Joyce Taylor in 1997. They stepped in with the intention of making this a trial in which owners and handlers would be proud to participate. They have more than attained their goal. Qualifications have become more elevated and constant. Now, the top eleven dogs in the Purina Top Dog standings are invited along with the previous year’s Invitational winner. If one of those cannot attend, it goes right down the list, so the final twelve dogs are truly some of the very highest caliber dogs of the nation. The format is two one-hour heats on two consecutive days. At the judges’ discretion, worthy dogs are called back for a 90-minute brace on the third day. The Taylors, Johnny and Joyce adeptly juggle a myriad of details to make this the A-1 event it has become. They ride every brace of the trial, with Joyce snapping pictures all day long. Not the least is the fact that they have spent countless hours recruiting sponsors who contribute an astounding amount of products to be given to handlers, owners and winners. Another large piece of the success of this stake is the Ornsby couple. They marshal and do what they can to help anyone. Johnny did have to take a couple of days off to go elsewhere this year but Rita was there in the saddle every day. She and Joyce manage the evening functions and try to keep Johnny T. on the right path as emcee. The judges for this year’s renewal were already a team before they paired up for this assignment. Chuck Stretz trains and handles Dr. Richard Steckley‘s dogs on the open circuit. Stretz, well-known professional trainer from Blackwater, Missouri has done his share of winning. He won this Invitational in 1991 with Rock Candy Man and in 2010 with Ninnescah Nicole. Add to that a bucketful of CHs and RUs, including the National Shooting Dog Championship with Arian in 1988. Dr. Richard Steckley of Wichita, Kansas has campaigned dogs with Stretz for a number of years and is the proud owner of the aforementioned Nicole. Steckley has made many trips to the winners’ circle in his own right. His Ninnescah line of dogs are dreaded competitors on the amateur circuit. Steckley handled Nicole to the coveted National Amateur Shooting Dog Championship title in 2011. Together the gentlemen had a lot of years’ experience and knowledge to judge these twelve contenders. 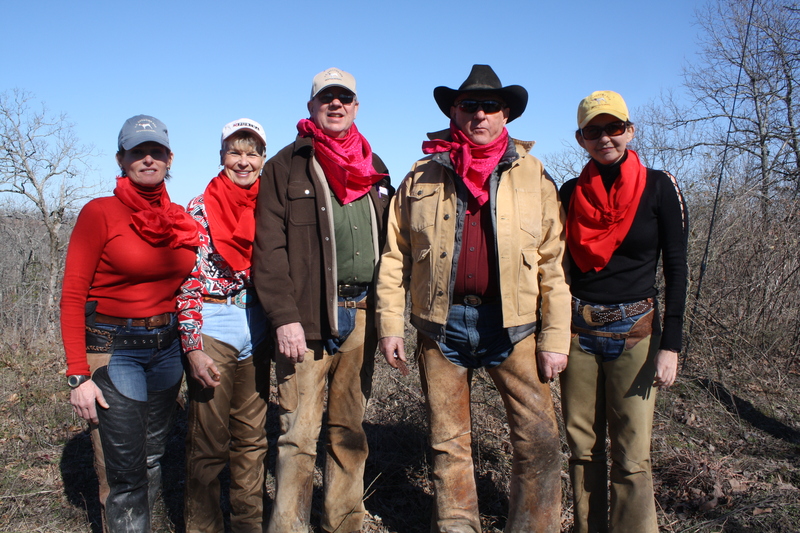 Their wives, Marla Stretz and Desi Steckley accompanied them to Camp Robinson and rode each day. They were a definite asset to the soiree. My thanks to both gentlemen for sharing their insights of the performances with me. Special thanks go to the benefactors whose generosity goes a long way to easing the financial burden of putting on a epic event with only twelve entry fees incoming. Namely, Lee Cruse, Charlie and Linda Jackson, Audrey, Jack and Brian Sanchez, Randy and Lynn Potter. With their kind endowment, entry fees have increased only $50 since 1990 and they have “sweetened the pot“ to guarantee a purse of $7500. There is a grocery-list of sponsors who so kindly provide product to be distributed to each handler and owner present. Topping the list, of course, is Purina Dog Food. Where would we all be without Purina? 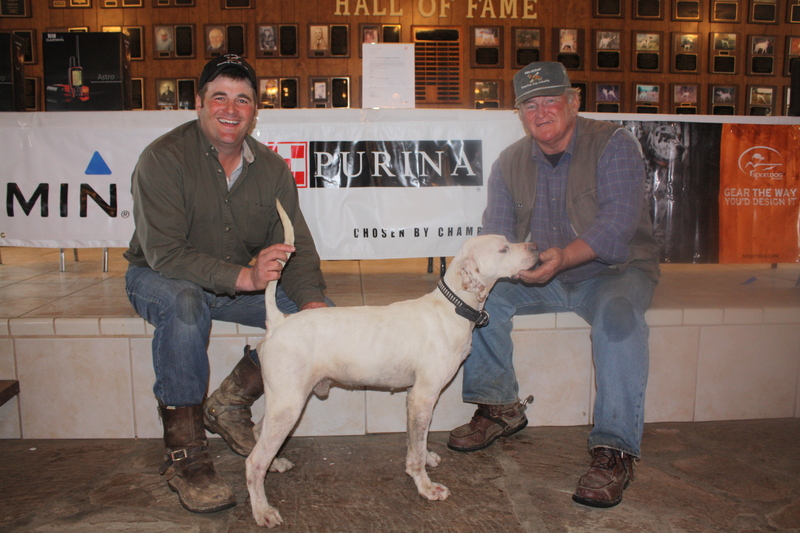 Roy Pelton, Purina rep was on hand and received an appreciative round of applause. Astro Garmin (electronic equipment); Tri-Tronics (electric collar); Gordon and Cindy Hazelwood/Purina (Montana Silversmith buckle); Art and Connie Crowell/Purina (caps); SportDOG (electronic systems, nutrition and wax-treated caps); Wilcox Feed (buckets, tubs, wormers, leather cleaner, tee shirts); Johnny Kirtley (wood sculptures), Heskett Saddlery (saddle bags), Jack Haggis (bridle); Rita Hornsby (woodwork and woodburnings); Leather Brothers (collars); Bird Dog Sipping Whiskey; The Collar Clinic; Larry Garner/Spalding Lab (Fly Predators Certificates and ByeBye Odor), Mike and Felecia McClanahan (TSC gift cards); Gun Dog Supply (gift certificates), Don and Ginger Kidd; Witt and Carol Stephens and Dr. Jeff and Melanie Hale. No one goes away empty-handed. Friday night the group began to gather in the spacious clubhouse for cocktail hour and a delicious barbeque dinner. Connie Crowell manages the kitchen very well and sees that drinks, snacks and the dinner menu are all coordinated. In her “spare” hours, she very ably marshals the riders in the gallery. Jill Smith is always on hand to help out with sundry duties. Vests and caps emblazoned with the USSDI logo were passed out to all the owners, handlers and judges. The drawing followed and dogs were paired with a different brace-mate and a different course for the second day. The Calcutta was next, which always brings some excitement to the air. Saturday morning, the group assembled by the clubhouse for the annual group photo of all the contenders before breakaway. Saturday night, another cocktail hour and a fish and chicken dinner with all the trimmings, followed by a new round of prizes. Ross Young’s beautiful oil painting of last year’s winner, Covey Rise’s Offlee Amazin was unveiled with owner Gary Hertz receiving the presentation. Rita Ornsby, woodburning artist presented to Hertz a gorgeous wooden box which she had created with hunting scenes depicted. And last but not least, perhaps, an Astro Garmin unit was put up for auction with Johnny Taylor doing the task of auctioneer. Sponsored by Gary Hertz and Drs. 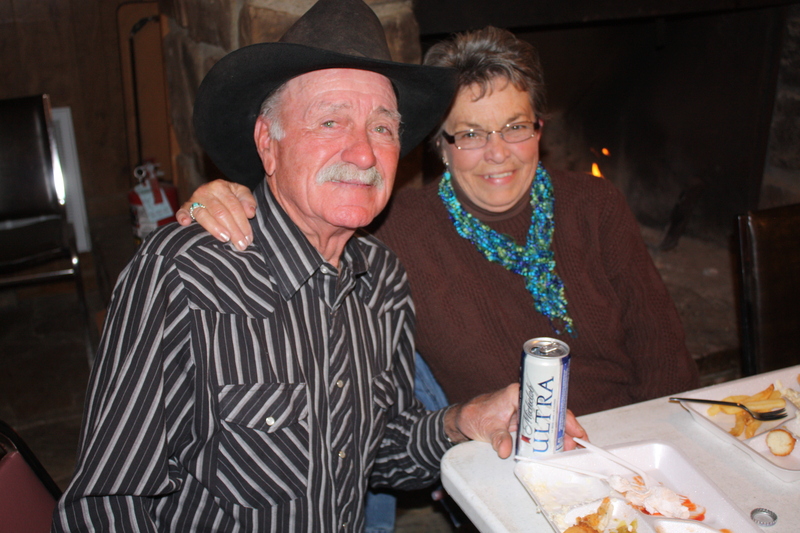 Thomas and Robin Morgan, owners of Covey Rise’s Offlee Amazin, the 2012 Invitational Champion, a sumptuous steak dinner was served to the group Sunday evening. J. D. Smith and Johnny Taylor presided at the grill and the ladies, Connie, Rita, Jill and Joyce did everything else! This was the night that everyone had waited for………the judges’ decision about who and how many would be called back. More goodies were handed out (you have to see it to believe how many prizes are given to the participants!) and finally the callback was announced. The judges called for two dogs to run and two dogs to be on standby. It is very probable that there was disappointment for some but more had probably seen the handwriting on the wall. The United States Shooting Dog Championship invites the top eleven dogs on the Purina Top Shooting Dog Awards list. The previous year’s Invitational winner is automatically invited. Now, we have twelve of the “winningest” challengers in the country all coming together. Unfortunately, the #1 dog on top of the list, Our Big Bully was retired in January due to a serious illness and ensuing surgery. Four others were out of the mix due to illness or retirement. 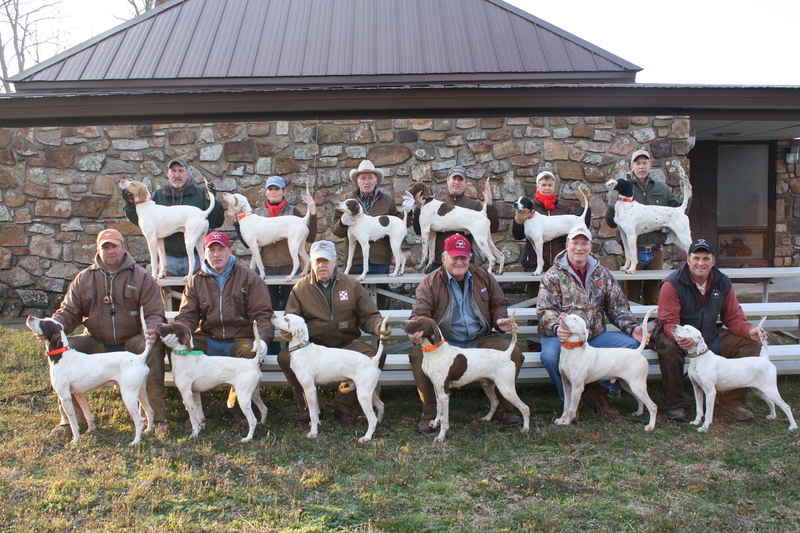 Still, the field was comprised of twelve of the top 17 dogs in the nation. Not a bad group! All dogs except two, had at least one of their owners riding to watch them compete. They came from Minnesota, New York, New Jersey, Oklahoma, Illinois, Texas, Virginia, Rhode Island and North Dakota. A sad note was brought to the attention of the group on Friday night. Bill McNamee, owner of Richfield Silver Belle had passed away just two days prior, following a serious illness. He was looking with anticipation to the trip to Arkansas to watch Belle and even had his plane reservations made. Our prayers and condolences to his widow, Claudia and all his family. I am sure he was riding with us in spirit. Each day, morning and afternoon brought between 30 and 40 spectators to observe the top-rated dogs do their stuff. Owners riding were Jack Sanchez, Ron Prewitt, Larry Brutger, John Roswech and his daughter Megan, Gary Hertz, Chris DelCollo, Chris and Heather Palmer, Bob and B. J. Dow and Dr. Wade Rosenberg. Other interested parties riding were Harold Woodward, J. D. and Jill Smith, Mike McClanahan, David Dosch, Jim Martin. Julie and Rick Steen of Vernon, British Columbia joined us to ride for several days. The Steens were on a field trial safari, traveling through the states visiting several premier trials on their bucket list. We were honored to have them and hope they return someday. In the road gallery, were Roy Pelton, owner Peter DelCollo (recent back surgery prevented him from riding horseback to watch Snow Warning), Jim Darnell and Steve Messick. The first brace saw Merrihill’s Carolina, owned by Ron Prewitt, handled by Shawn Kinkelaar. “Bette” won runner-up at Tennessee and 1st at Hall of Fame OSD Classic to garner the summons to Camp Robinson. Paired with her was Great River Ice, owned by Audrey, Jack and Brian Sanchez, handled by Mike Tracy. “Dan” won Ontario OSD Championship, Ohio-Penn OSD Championship, Atlantic Coast OSD Championship, runner-up at New England OSD Championship, 2nd at the Maryland OSD Classic and 2nd at the Imperial OSD Classic. “Bette” ran a nice, showy race for the hour but she wasn’t able to connect with game. “Dan” had two good finds, one at 15 and one at pickup time. He stood with high head and tail, exemplary style and manners. Ridge Creek Cody, owned by Larry Brutger, handled by Shawn Kinkelaar was released for the second brace. “Cody” won the Idaho OSD Championship, was runner-up at All-American OSD Championship and 1st at Lee County FTC. His bracemate was Max Jack’s Tot, owned by Dr. Bob and B. J. Dow, handled by Jack Herriage. “Tot” won runner-up at the Ozark OSD Championship, runner-up at Missouri OSD Championship and was 2nd at Lone Star OSD Classic. Tot was standing at 44, with a nice stylish find; Cody in a backing position. “Cody” ran a big race, not as consistent as desired. Tot was fast and classy in her ground race. Both dogs had short absences. The third brace included Richfield Silver Belle, owned by the late Bill McNamee and Claudia McNamee, handled by Mike Tracy. “Belle” won the South Carolina OSD Championship, was runner-up at Ohio-Penn OSD Championship, runner-up at Keystone OSD Championship and 1st at Fort Mill OSD. “Belle” was down with Miller’s Atomic Rain, owned by Dr. Wade Rosenberg, handled by Shawn Kinkelaar. “Lady” won runner-up at Northwest Chukar OSD Championship, runner-up at Southwest Missouri OSD Championship, 2nd at Beaver Creek OSD Classic, 2nd at Lee County FTC and 3rd at Fleetwood OSD Classic. “Lady” showed her heels on this outing and scored first at 8 minutes. She settled in and ran a strong, smooth race for the last half. “Belle” had an excellent find at 54 following an unproductive at 34. She was distracted a brief time by deer. In the afternoon session, Touch’s Hard Times and Sugarknoll Snow Warning were away after lunch. Sugarknoll Snow Warning, “Bud” owned by Peter and Chris DelCollo, handled by George Tracy won the National OSD Championship and runner-up at Gulf Coast OSD Championship. The Del Collo’s certainly were not newcomers to this stake; their Sugarknoll Buckshot won the Invitational in 2008. Touch’s Hard Times, owned by John Roswech, handled by Shawn Kinkelaar. “Jake” won the Northwest Chukar OSD Championship, the All-American OSD Championship, runner-up at South Carolina OSD Championship and 1st at the Fleetwood OSD Classic. “Jake” and his handler were well attuned as he laid out a very showy race. He had one good find at 43. “Bud” seemed to have his own agenda and was absent for 30 minutes of the hour. Heritage, owned by Jack Sanchez and Tom Hance, handled by Mike Tracy won the Eastern OSD Championship and the Garden State OSD Championship. Perkins Happy tobe Here, owned by Patrick Mattingly and handled by Stacy Perkins was braced with Heritage, “Man”. “Happy” won four open shooting dog championships the past season which merited this invitation; namely, Kentucky, Ozark, Illinois and Midwest. “Man” showed good connection with handler, had an unproductive at 35 and was on point again at 42. It was reported that birds had left but were unseen by the judicial team. “Happy” ran a fast, strong race, going to all the likely bird haunts. He pointed, corrected and continued a couple of times but could not come up with game in the hour. The last brace of the day saw Calico’s Catch N Release and Covey Rise’s Offlee Amazin, last year’s champion at the line. Calico’s Catch N Release, owned by Calico Kennels and Chris and Heather Palmer, handled by George Tracy. “Buddy” won the Keystone OSD Championship, Georgia OSD Championship, was runner-up at the Southeastern OSD Championship and 3rd at the Hall of Fame OSD Classic. Covey Rise’s Offlee Amazin, owned by Gary Hertz and Drs. 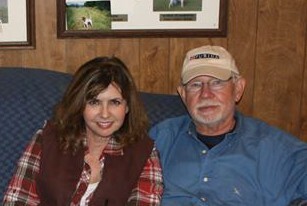 Thomas and Robin Morgan, handled by Shawn Kinkelaar. “Braxton” won the Tennessee OSD Championship and was the 2012 US SD Invitational Champion. Each dog had an unproductive, “Braxton” at 39 and “Buddy” at 52. They each handled well and ran strong, showy races but had no bird contact during the hour. Covey Rise’s Offlee Amazin (Kinkelaar) and Heritage (M. Tracy) started the second day’s running at 8:04. For the second day, “Braxton” ran a strong showy ground race. At 16, point was called, birds flushed, all in order. Following a lengthy, forward cast, at 46, once again he stood. Beautiful style. Birds were kicked up, all in order. “Man” had a nice find at 8, standing with good style and manners. At 35, a nonproductive. In both appearances, Man showed good application in his ground effort. Sugarknoll Snow Warning (G. Tracy) didn’t appear to be suiting his handler. Tracking unit was requested at 38. Perkins Happy tobe Here (Perkins) established point at 5, corrected of his own volition, flight of birds was called and handler shot, took him on. No further bird work. Calico’s Catch N Release (G. Tracy) applied himself better on the second day but alas, no birds. Touch’s Hard Times (Kinkelaar) rendered a smooth flowing ground race throughout, with a good find at 5. Toward the end of the heat, he made a cast to the right as the course bent to the left and was gathered at the finish. Max Jack’s Tot (Herriage) ran a snappy race. At 42, point was called but handler was unable to put birds into the air. “Tot” was absent before the mountain crossing and handler chose to call it quits at 54. Miller’s Atomic Rain (Kinkelaar) ran a strong race, somewhat erratic at times. She was AWOL at pickup. Great River Ice (M. Tracy) continued his winning ways with an excellent, forward race. He and Ridge Creek Cody (Kinkelaar) were both standing at 46, with “Dan” in the slightly forward position. “Dan” impressed with his statuesque style, which was sustained after the shot. “Cody” was charged with an unproductive at pickup time. Merrihill’s Carolina’s (Kinkelaar) race was not up to the standard of the first day; she had barren stands at 4 and 30. Richfield Silver Belle (M. Tracy) had an early mishap when she failed to back Carolina at 5. So ended the initial running; all were anxious to find out who made the “callback”. The judges requested that Great River Ice (M. Tracy) and Touch’s Hard Times (Kinkelaar) be on the line at 8:00 A.M. on President’s Day. These were the two dogs that they wanted to look at in the finals; two stand-by dogs were named, just in case: Covey Rise’s Offlee Amazin (Kinkelaar) and Heritage (M. Tracy). Breaking away under cloudy skies, with a gentle rain falling, there was a good-sized gallery to watch the performances of the two finalists. Touch’s Hard Times made his way down the left fence line, with point being called at 9. Kinkelaar was unable to flush birds and tapped the dog to relocate. When the covey lifted, he stopped to honor the flight. Both dogs ran the courses well, showing to the front. Great River Ice crossed the mountain well to the front and was seen far ahead as gallery came over the mountain. Point was called again for Hard Times at 38 who was buried in a briar patch past Cat’s Crossing. Birds were put in the air, everything good. Great River Ice made a long, forward cast along the lake’s edge and was rewarded at the end of it with a find at 41. Handler called flight of birds prior to the arrival of the judges. More birds were observed; all in order. “Dan” was shown on another good find at 52 in a corn strip near the lake, once again at the end of a far-flung cast to the front. True to form, the white dog displayed excellent style and etiquette throughout the stand, birds located well. At 58, “Jake” had a find in a field after the far loop; all in order. He then suffered an unproductive at 103. Both dogs continued to run to the front in the soft rainfall. At time, “Dan” was going to the front; “Jake” finished at a likely bird site. Stretz and Steckley deemed they did not need to look any further; they clearly had a winner. Back to the clubhouse for one of Janice Stroud’s tasty lunches and the BIG decision! When I was asked to report this trial, I was aware of the shoes I would being trying to fill, such as those of Bernie Mathys, Neil Mace, Joyce Taylor, Pat Kammerlocher, Gerry McKenzie. I hope I did justice to this stellar event and offered even an inkling of the thought and effort that goes into making the Invitational one of the foremost trials of the year. See the 2013 Championship photos under the Photo Gallery tab.